Incredible Views & Super Close to BOARDWALK! Pet Friendly! This single story, pet friendly, 3 bedroom, 2 bath home can accommodate 14 guests and is just steps from the beach. Located in Morgantown, you'll also have access to two community pools and tennis. Welcome to our wonderful beach house "Dreamscape" on the beautiful Fort Morgan Peninsula. 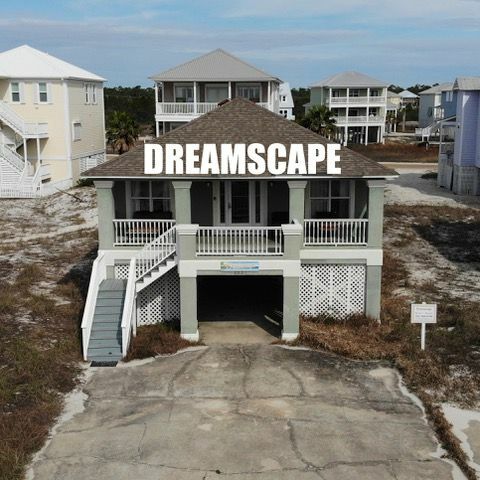 "Dreamscape" is located at 6023 South Sea Circle, Gulf Shores, AL 36542. Dreamscape was perfect for our vacation. It was very clean and very roomy. Such a comfortable place and easy access to the beach to allow 75 to 82 year old ladies to get to the beach. We're so glad you and your mama and your siblings had a wonderful time at our home. We'd love you to see you next year for your yearly vacation! Great location. House needs some TLC. New cushions on porch furniture, fix missing spindles, new skillets in kitchen. Thanks for taking the time to review Dreamscape! As you can imagine, because this home is located in such a desirable location, it is extremely popular and is booked almost nonstop. We'll pass your comments along and make sure your concerns are addressed, if they haven't already been taken care of. It sounds like, despite the issues you mentioned, you still managed to have a great vacation and we look forward to your return visit! Great location right by the boardwalk to the beach. Lovely house with great "bones" but very poorly maintained. Leaky toilet (called first day, never got fixed), refrigerator, washer, dryer (hazardously coated with lint) on their last legs, leak under kitchen sink with a bowl to catch water (smelly), smoke detector missing and a few more picky details. Needs some cosmetic updates also but those were less pressing issues to us. We did love our stay and will definitely go back to Morgantown, just find another house. Must eat at Behind the Pines Restaurant, great local atmosphere with FRESH food not overcooked and fried. Great breakfast at Kiva Dunes Restaurant. Call Beach Bum Services for beach canopy and chairs rentals, extremely nice, fair price and prompt. We have fixed the minor issues -- adjusted the chain and flapper valve in the toilet, cleaned the dryer lint, repaired the sink plumbing and other things. Dreamscape is a very popular house and sometimes it's hard to find time between guests to get in and fix it up All is well now. I absolutely loved this home. It had way more than enough pots pans etc. To cook and grill out. The place had amazing AC. The beds were very comfortable and we had a ton of room. The location was perfect it was basically the same walk as if your house was directly on the beach my husband and I said this was way quicker of a walk than from hotels we stayed on that were on the beach. The house was very clean and had plenty of extra blankets and pillows in the closest. I will definitely be back for our trip next year. We can't to see you next year! Thanks so much! This is house is a great size for a big family. A very short walk across street to the beach. We brought our dogs which was a big plus for us but I was a little disappointed that there wasn&#x2019;t any green space for them to run around. 100% my fault for not researching the area. The house all the necessary kitchen items you would need to prepare meals. Our kids went down to the pool and really enjoyed it. Management was quick to respond when we first arrived and locked ourselves out of the house without the code. We're so glad you enjoyed our home and thank you for the shout out for RelaxontheBeach. Please come back and bring the pups again soon. We do have some dog parks in town, away from the sandy beach, if they need a little grass under their paws. The house fit our needs perfectly. Even though we were across the street, we had a great view of the gulf. Our party of 10 was very comfortable. Our only maintenance issues were a stopped up tub drain and a leaking ice maker water line. Overall, we had a great experience. I highly recommend Dreamscape. Thanks so much! We're so happy your family reunion was a success! We're looking into the tub drain and the ice maker water line. Thank you for bringing them to our attention.